Newburgh Free Academy hosted Rice at NFA on Saturday, February 12, 2011 in Newburgh, NY. Rice defeated Newburgh 85-58. 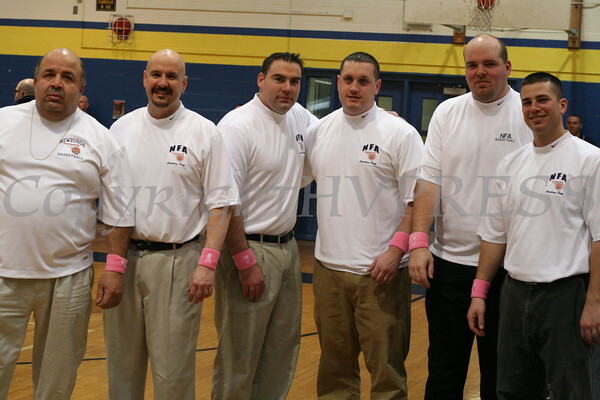 Coaches vs Cancer: The Newburgh Free Academy coaching staff all wore pink wrist bands in support of cancer research as funds raised from the NFA-Rice game on Saturday, February 12, 2011 in Newburgh, NY were donated to the American Cancer Society. Rice defeated Newburgh 85-58. Hudson Valley Press/CHUCK STEWART, JR.